Arrrrrrr matey’s! It be Pirate’s Day soon on September 19. Get sea dogs an’ land lubbers up an’ ou’, an’ dressed like a shipmate t’ participate in this festive event! After seekin’ Dread Captain Demeza in Stranglethorn Vale, stick around an’ be havin’ a big swashbuckler party wi’ lots t’ drink! I’m going to start this article with something that I ended the Ninja’s Day Article with: the Savory Deviate Delight. Kirina under the “Yaaarrrrr!” effect of the Savory Deviate Delight. 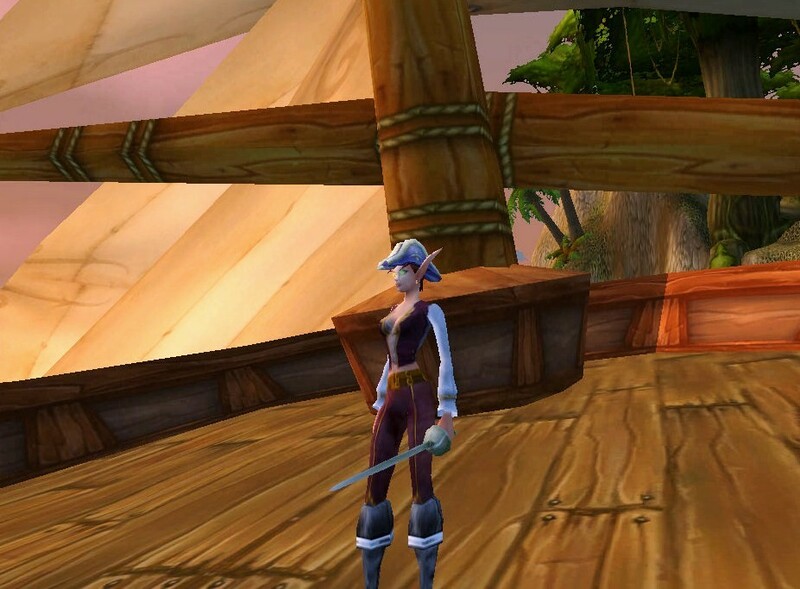 The Captain Sander’s Sash, as seen in several other outfits around this site, is a reward from a neutral quest that begins from looting a map from the murlocs along the coast of Westfall. There are some other alternatives: the Apothecary’s Waistband (Horde vendor only), Swashbuckler Sash (neutral quest reward), or the Burning Blade Devotee’s Cinch (reward from both an Alliance and Horde quest). The X-52 Pilot’s Leggings is also a reward – its from a neutral quest out of Netherstorm. To my knowledge, there are no other pants with orange stripes for a substitution to these- only blue or green (Sage’s Pants and the Shimmering Trousers, respectively). 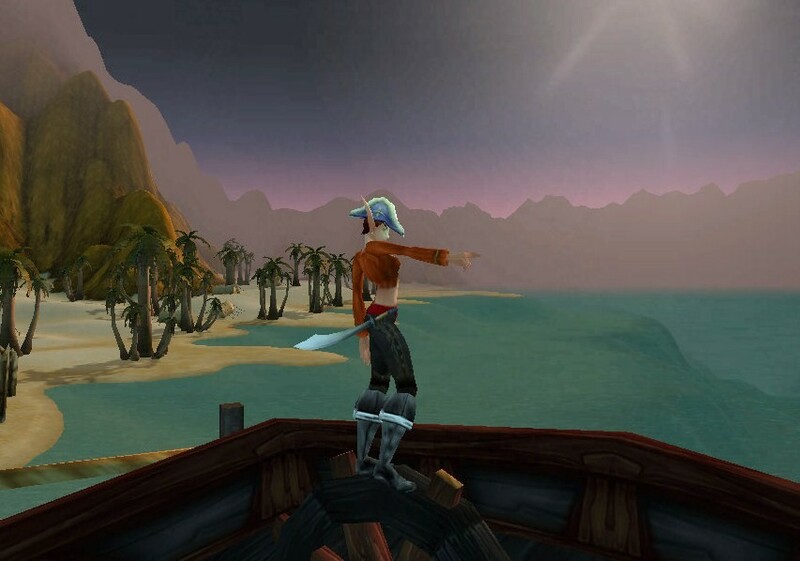 The First Mate Hat is one of the best party hats in-game, in my opinion. It is a very, very low drop from the Bloodsail pirates found in Stranglethorn Vale. 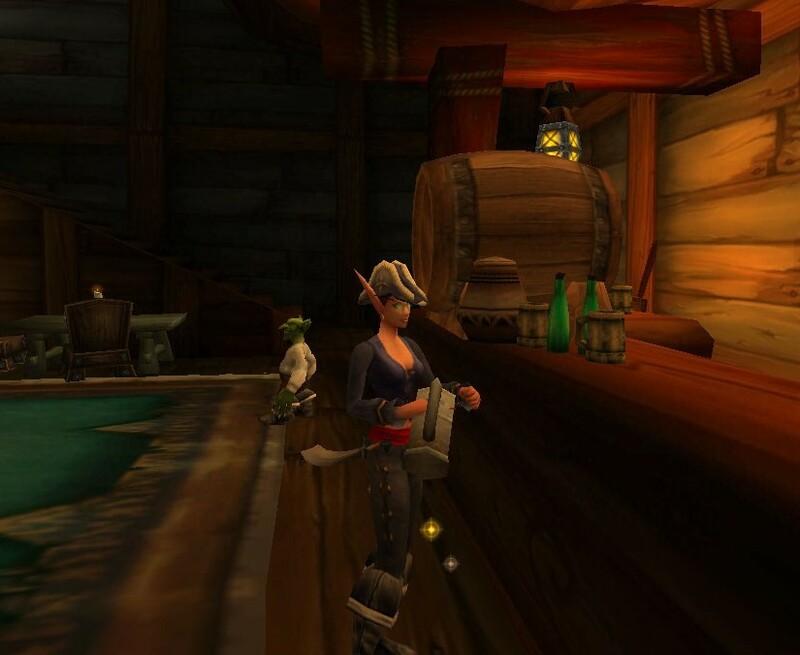 However, I believe you get reputation for some of the Goblin cities (like, Booty Bay and/or Ratchet) upon killing these pirates – granted you’re not “at war” with them trying to get the Bloodsail Pirate uniform – which, let’s you still “win” in some degree if you decide to farm for it. Really though, it’s all about luck – getting it to drop, or finding it on the auction house for a reasonable price (again, someone got around 550 gold from me…but I’ve seen this hat listed for at least 1000g more on Lightninghoof). As I said, same type of outfit. One could even wear the Black Swashbuckler’s Shirt, or one of a different color, under the vest. The Blackened Defias Gloves are a zone drop out of The Deadmines, and can be seen in many other outfits around this site. 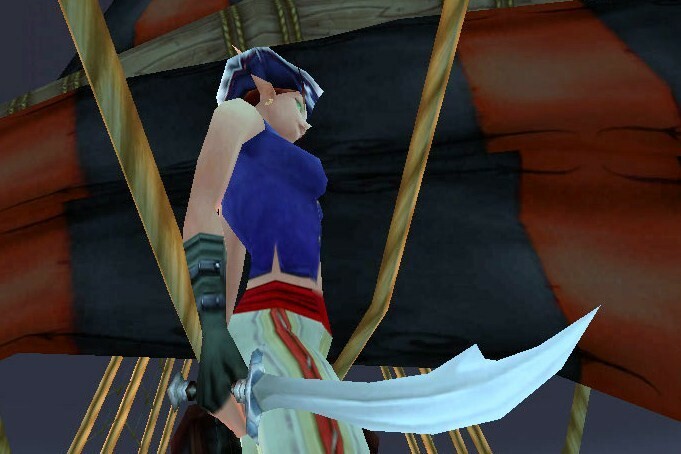 The two swords: the Ebon Scimitar and the Light Scimitar, are, in my opinion, good-looking pirate swords. Each sword has many different alternatives – some are dropped, some are rewards, and some can be bought, like the Falchion, which shares the same model as the Ebon Scimitar. A close-up on Kirina’s Light Scimitar. 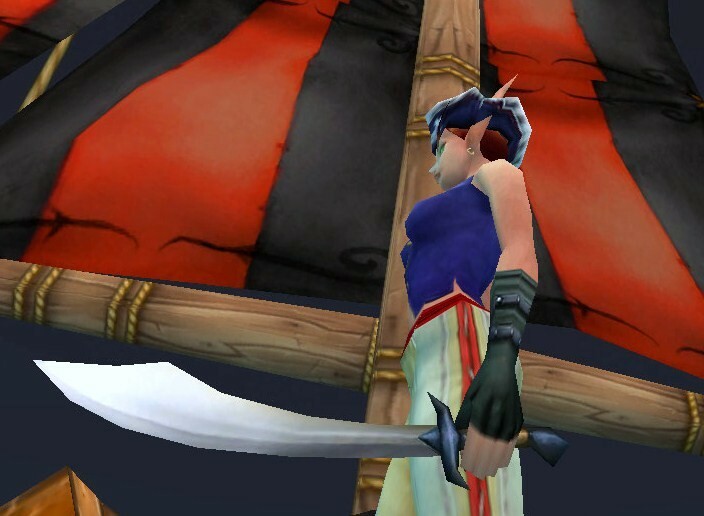 A close-up on Kirina’s Ebon Scimitar. You could always just where a plain white T-shirt with this outfit (or, “wife-beater”, in this case), for a drunken deckhand look. 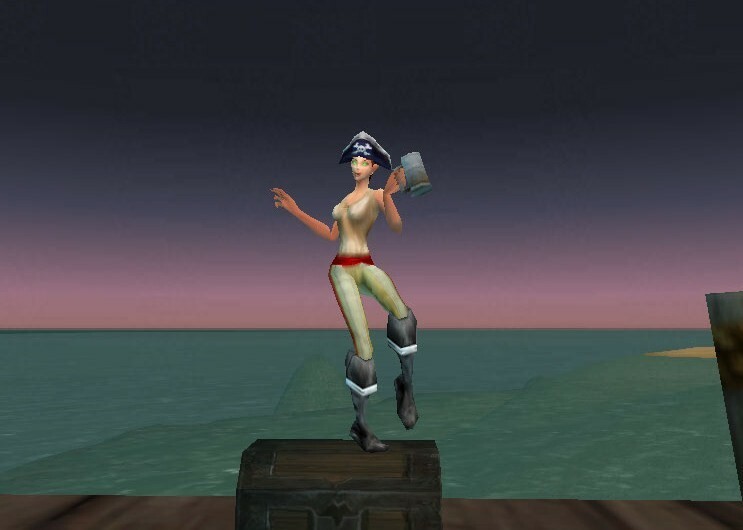 The Deckhand’s Shirt isn’t very hard to get if you’re a higher level, as it is a low, but not uncommon drop from the pirates found along the coast south of Ratchet in the Barrens. And, I believe those pirates give Goblin city reputation as well (at least they did for me when I was looking for this back in the day). 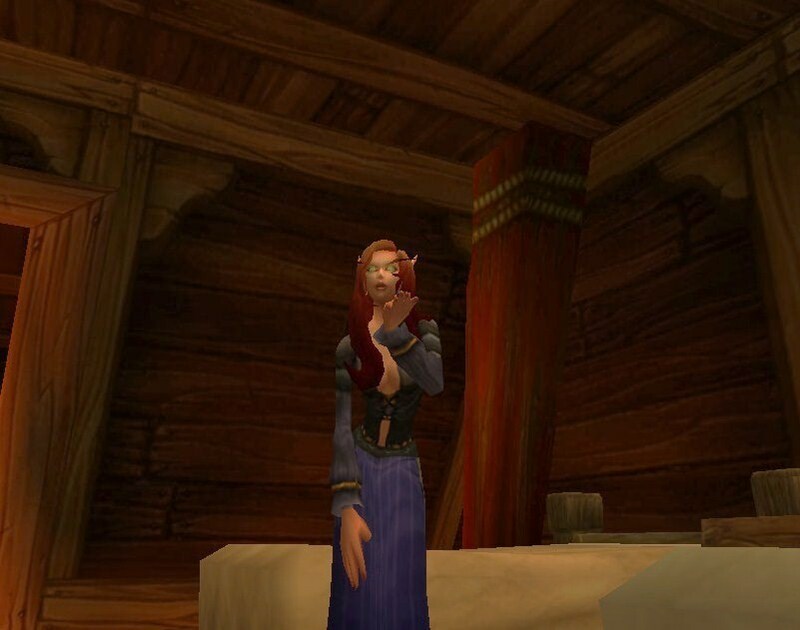 There are some other alternatives, with different styles, to match one’s taste: The Sleeveless T-Shirt (Alterac Valley zone drop) or the Captain Sander’s Shirt (neutral quest reward) – which, actually has some sort of short sleeves to it. The Ornate Drinking Stein can be replaced with any other desired stein off-hand. This next outfit is a simple Swashbuckler outfit to put together. Most of the articles of armor in this outfit is crafted. Those that aren’t can be altered to fit ones armor availability. 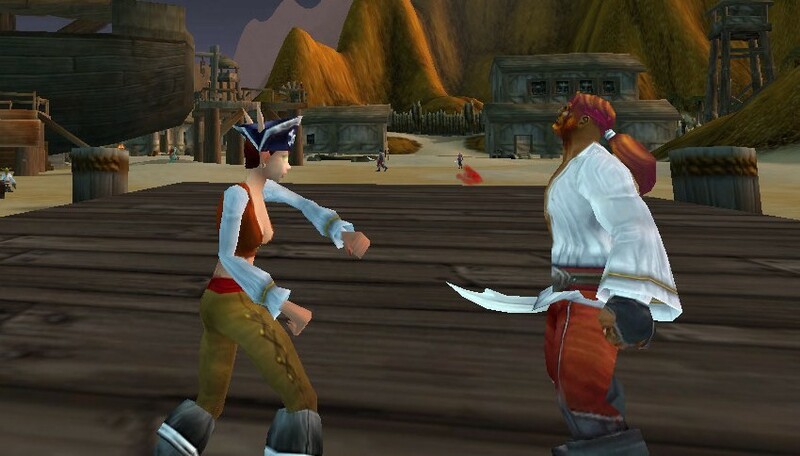 To keep it simple, the Buccaneer’s Boots could always be replaced with any other boots, such as the Recruit’s Boots, which are the Alliance Human/Gnome/Dwarf warrior starter boots and/or can be bought, for cheap, through Thomas Yance. 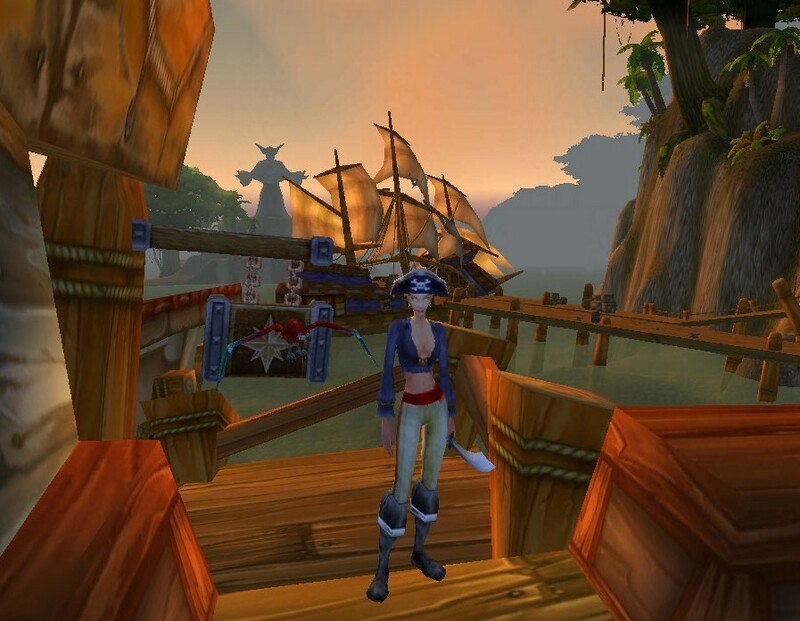 And, the First Mate Hat could be replaced with any other “piratey” hat, like the Admiral’s Hat (also in this article), or, keep it simple with a headband of some sort, like the Red Mageweave Headband. 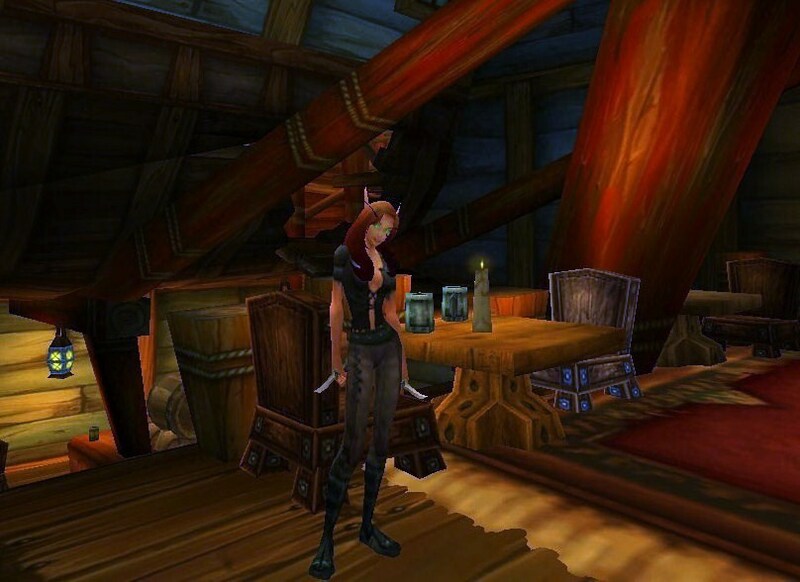 The Corsair’s Overshirt is a drop from the final “boss” in The Deadmines. However, it can always be substituted for the Red Swashbuckler’s Shirt – which looks exactly the same, and can be worn by any level. Another piece of gear in this outfit that can be worn by any level is the Haliscan Pantaloons. These pants can be adapted into so many different outfits, and the fancy “embroidered” design that runs down each leg adds elegance to this captain outfit. The Admiral’s Hat is crafted by tailors. 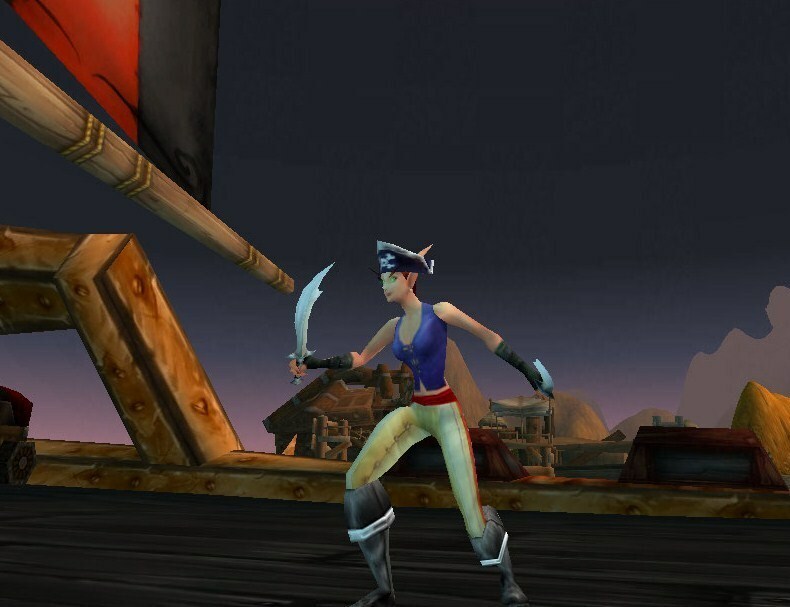 It has the same model as the Bloodsail Admiral’s Hat, only blue instead of red. The blue material of the Knitted Pants, the Black Swashbuckler’s Shirt, and the Admiral’s Hat, all match, and are accented by the black leather of the Bandit Boots and the Ruffian Belt. As mentioned before, the Recruit’s Boots are another great “pirate-like” boot, in my opinion; they are an exact match to the Bandit Boots listed in my outfit. This is basically the same outfit as the one before it, only with moderate changes. The Blue Linen Vest was added for more…coverage ^_^ . This next outfit is a little bit more feminine; however, would still look great on male characters. 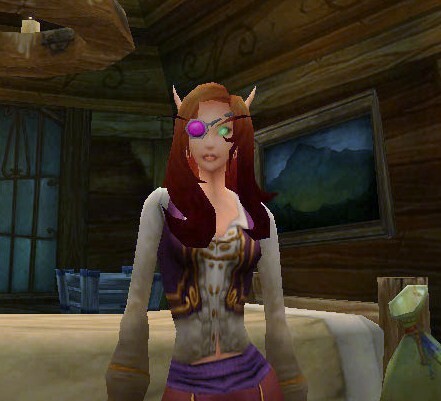 I actually got the Starfire Vest for Kirina while leveling Merlaina – it’s an Outlands world-drop. I’ve used it in a couple of outfits so far, but, it’s a really nice vest even for general everyday wear. The Adamantite Rapier is crafted by blacksmiths, and, is the perfect sword for that “frilly, fencing, swashbuckler look”, which, is ultimately what this outfit is going for. That being said, this outfit can still be pieced together using different items, especially for chest pieces. 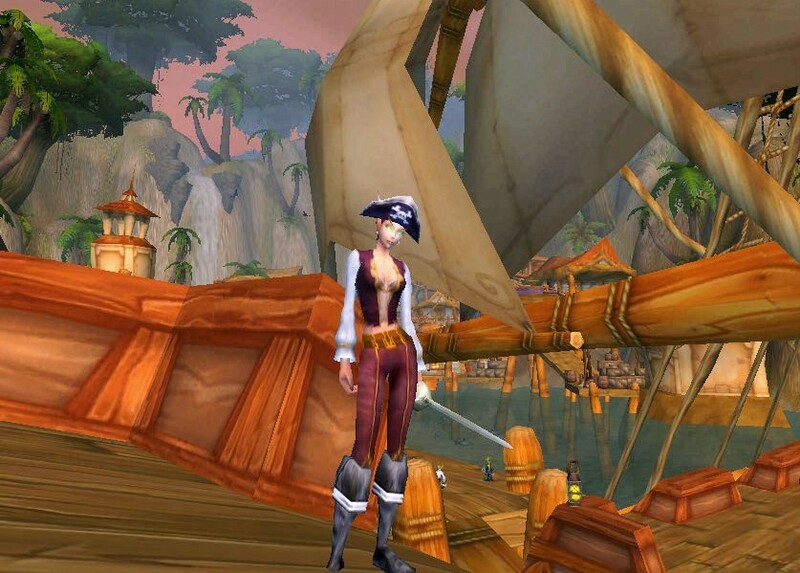 The same outfit can be worn with the First Mate Hat. A different chest piece could be the actual Embroidered Armor, but, LoL, I always change up the outfit on you! The Embroidered Armor is kind of “dirty” around the cuffs of the sleeves, so, I imagine, for a pirate, this was once a really nice, fancy shirt; however, as seen its days of adventure and roughness now. The Regal Armor could be a substitute, if anyone would prefer blue, but, it may be harder to get than just buying some pieces of gear off a vendor. I love Kirina’s High Councillor’s Sash. It shares the exact same model with the Captain Sander’s Sash, but is light purple ^_^ . If you aren’t lucky enough to loot this, or find it at your local auction house, the Wizard’s Belt is a very pretty alternative. 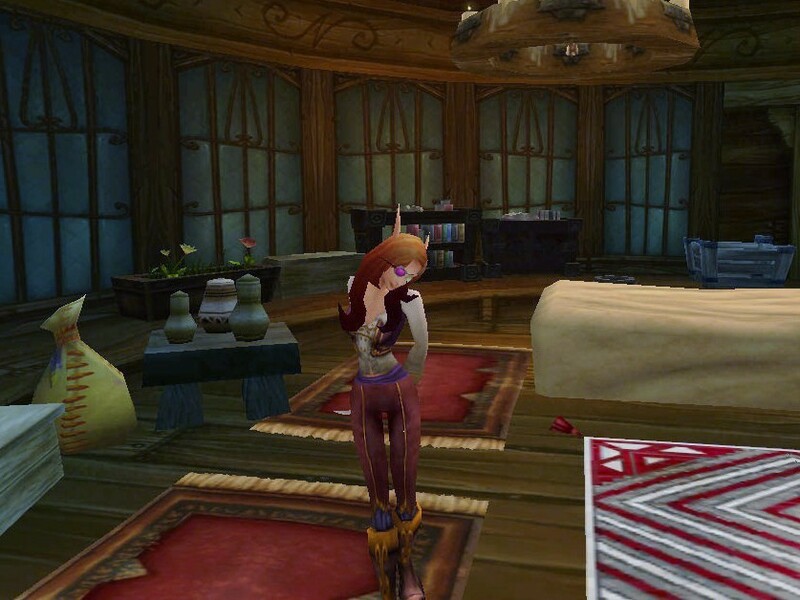 I feel really…cheesy….when I have to say that almost all my armor was bought off the auction house. I hope that in some way it does not take away all my credit ^_^ . But, really, browsing the auction house can bring you rare finds that the seller: a) doesn’t know how rare/unique it is (which is kind of sad because maybe they would want it), or b) doesn’t care…if they don’t sell it there, they’ll probably vendor it. This Amethyst Beholder Eye is a good example of this. However, the seller did know how rare this item could be, and sold it with a price to match, but, I knew I would never see it again…and, I didn’t even know it existed before I saw it listed on the auction house! There’s actually 3 more like it that drops from the same rare mob: the Crimson Beholder Eye (plate), the Emerald Beholder Eye (leather), and the Fiery Beholder Eye (mail). You could make a matching outfit for each of them! Again, the High Councillor’s Sash can be replaced with the Wizard’s Belt with no loss of any “girlie” effect ^_^. 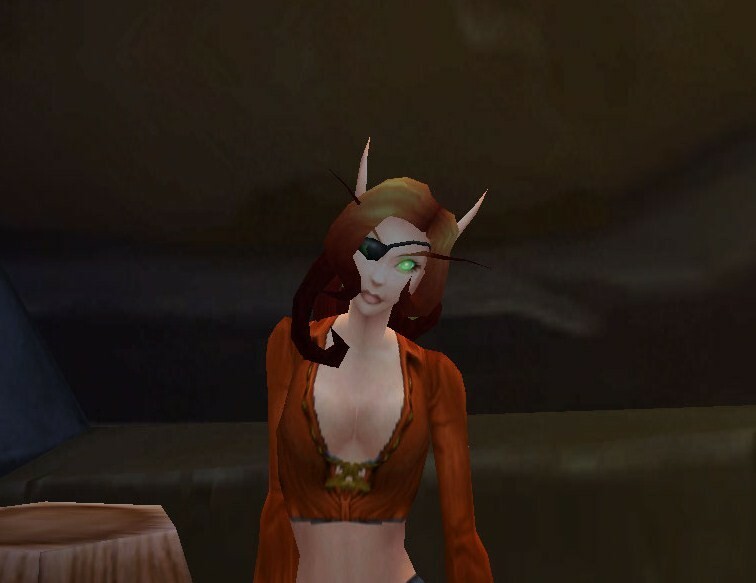 This was another “gift” to Kirina by leveling Merlaina in Hellfire Peninsula; it’s a low to non existent drop from the Outland’s and, I was surprised to find it. 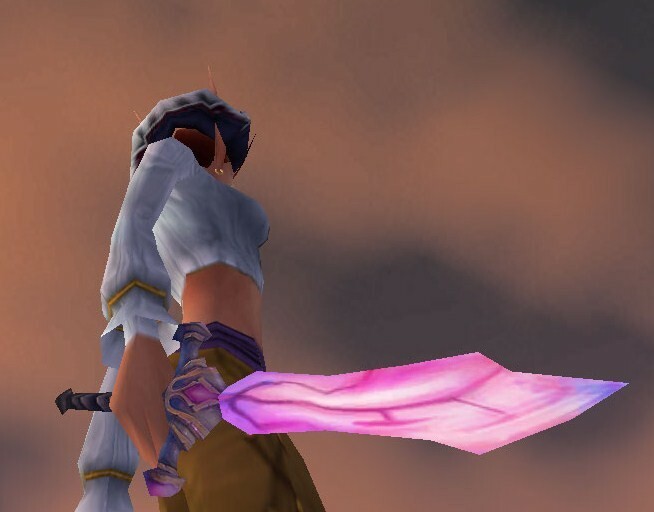 This is the type of sword to look for on the auction house…I mean, it’s pink! Hopefully, no one else will want it either. This outfit is much more rugged, and, looks hot on girls, but, guys could wear something like this too to be that seedy adventurer. I based this type of outfit around all those pirates who are wading around in ankle deep water, attacking anyone who tries to steal their (or “the captain’s) treasure. They are sunburned, hostile, and possibly a bit starved. Any items that look rugged, torn, and/or dirty will be great pieces to add/change in this outfit. LoL /Sigh. Yeah, I went there. But, a pirate captain needs a bunk mate, right? Or the crew a traveling barmaid? Both of which denote something more than a PG-rated site, so, I’m not going to bring in any more details ^_^. But, if you wanted to be the ultimate girl (or the funniest guy), wearing a skirt to a pirate pants party can still turn out okay if you pair it up with something rugged and dangerous, like the Tattered Cloth Vest. I hope everyone as enjoyed these outfits, and hopefully, they’ve inspired you to make your own original pirate outfit for the 19th. Happy Pirate’s Day!